Gail Erskine the President of the Children’s Book Council of Australia NSW Branch Inc and Morag Tunks the President of the Eastern Suburbs Sub-branch welcomed guests and provided history of the Children’s Book Council of Australia, its growth and strength in connecting children with quality Australian literature since 1945. The children’s book illustrator Cate James revealed the logo she designed for the CBCA NSW Branch Inc Eastern Suburbs Sub-branch. Both sand and surf are represented in the design and each Eastern Suburbs neighbourhood is featured. We are very proud of Cate’s superb design which is sure to be viewed and enjoyed by many. Throughout the evening we were kept informed and entertained by our dynamic MC’s Libby Hathorn and Susanne Gervay. Paul Macdonald from The Children’s Bookshop promoted the need for conversations about books with children. Paul updated us on key trends in book publishing for children with the rise in picture books, series, fun reads and narrative nonfiction. The growth in demand for transition books for children towards the end of primary school and early years of high school was also highlighted. 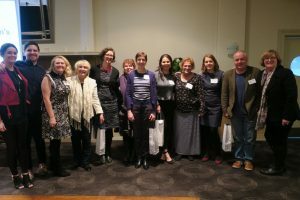 Debra Tidball shared her passion for being involved with the CBCA NSW Branch Northern Sydney Sub-branch as it has enabled Debra to connect and meet with a wide array of authors and illustrators. Debra’s love for Australian children’s literature became evident when she started collecting picture books to read to her children. Debra’s latest book The Scard Book is a CBCA Notable book and has just been awarded a Crystal Kite Award! Catherine Pelosi spoke of her journey as a new author and the release of her first novel Quark’s Academy. Since its release, it has proved to be a huge success and has taken Catherine to many school visits where science experiments are part of the author talk, and to the Middle East where Catherine spoke about her book to students at 2018 Sharjah Children’s Reading Festival. It was a delight to meet the children’s book illustrator Cheryl Orsini who has been illustrating since a very young girl. Cheryl shared an amazing collection of illustrations, each with its own story. Cheryl and her daughter’s fascination with caravans is evident in her work and certainly makes a caravan trip look very hip. I wonder how many nooks and crannies and delicious edible treats have been illustrated by Cheryl in her numerous picture books. Our final presenter Erin Gough polished the evening with her wit and love-hate relationship with reading as a child. Too many books collected over time became a problem for Erin causing difficulty in finding shelf space for her book collection. Mispronunciations of words as a young reader caused Erin many troubled conversations. Erin informed us that she was sleep deprived as a young reader and still to this day finds it difficult not to go to bed unless she has made a tent with the sheet and has a touch under the covers to read the next chapter. Erin finalised her highly engaging presentation on a positive note of being a young reader and the problems it causes are after all worth it. 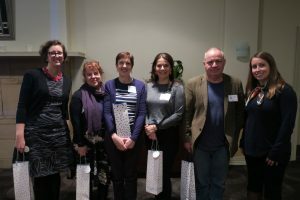 A huge thank you to Jacqui Barton from Harper Collins and Chris & Melissa Tantchev from Bookabuy who donated prizes for the event. It was a superb venue, truly grand and we greatly appreciate the generosity of the Bonnie Doon Golf Club in supporting us. Thank you to all involved and all who attended, it was a group effort that made the event such a huge success, without you the night would not have happened. Well, now that it is all wrapped up we need to move onto organising the CBCA NSW Branch Inc Eastern Suburbs Sub-branch children’s event which will be held at the Randwick Community Centre on Thursday 25 October from 4pm. Hope to see you there!